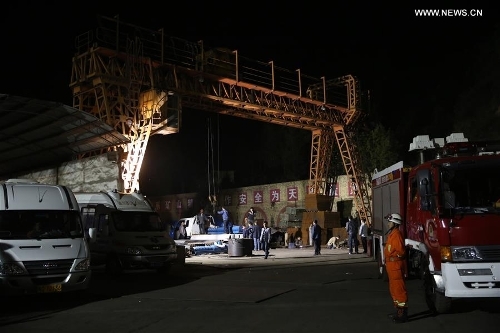 The death toll in a coal mine collapse in Northwest China's Shaanxi Province has risen to 21, as rescuers found two more dead miners Sunday morning. The accident happened around 4:30 pm Saturday at the Lijiagou coal mine of the Baiji Mining Company in the city of Shenmu. At that time, 87 people were working underground and 66 were rescued. An investigation into the cause of the accident is underway. Shenmu, located at the border area of Shaanxi and Shanxi provinces and Inner Mongolia Autonomous Region, has rich coal resources of over 50 billion tons, accounting for 30 percent of the country's total coal resources, news site caijing.com.cn reported Sunday. Shenmu had many unsafe and privately-owned coal mines before 2003. Newer mines have now reached the remnants of the old mines, which are posing great safety threats, according to the report. Coal mine accidents caused by toxic gas have happened before in Shenmu. According to the caijing.com.cn report, 18 miners were killed by toxic gas in 2008. On January 6, 2016, illegal blasting at a coal mine in Shenmu caused the release of carbon monoxide that killed 11 miners.